Here’s an important health tip for you, your children and your grandchildren: stay away from energy drinks. More and more evidence is emerging that shows these drinks can cause some serious adverse health effects. 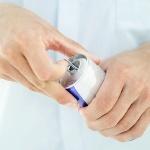 Although no time is a good time to have an energy drink, having one while at work could be particularly problematic—especially for those who work with machinery, or in health care professions. The researchers also caution that the use of energy drinks during pregnancy or breastfeeding is of particular concern, and more patient education is needed with this particular risk. The biggest group at risk from this new hazard is adolescents. Teens are reportedly consuming these drinks at an alarming rate. Another clinical trial and another set of medical professionals have stated the need for educational intervention to inform adolescents of the consequences of consuming these popular beverages. They go so far as to suggest school nurses have an obligation to teach adolescents about potential side effects. If you have any teens in your extended family, do what you can to increase their awareness of the dangers that some of these drinks pose. There are all kinds of healthy ways to boost energy levels without causing any harm. For health advice about why everyone in your family will also want to avoid consuming soft drinks, read the article Think Diet Soda Is Okay? Think Again! Guilbeau, J.R., “Health risks of energy drinks: what nurses and consumers need to know,” Nurs Womens Health. 2012 October; 16(5): 423-8. Pennington, N., et al., “Energy drinks: a new health hazard for adolescents,” J Sch Nurs. October 2010; 26(5): 352-9.